My job takes me downtown every so often for a variety of reasons. I don't typically like to park in garages, but sometimes circumstances warrant it. 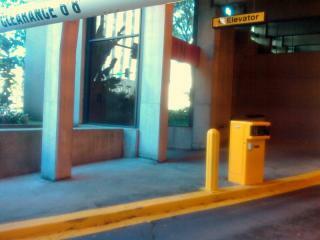 The elevator walkway dumps pedestrians out into the automobile drive aisle instead of onto a sidewalk. The photo below shows how in order to exit the parking garage, a pedestrian is directed out into the path automobiles use to enter the garage. There is a six inch drop, with no curb cut anywhere along the path of travel. Since this isn't the only elevator, perhaps it is not a technical violation of the Americans with Disabilities Act, but it is at a very minimum a poor design solution. Now, to be fair, the other elevator appeared to have a usable path from the designated accessible parking spaces to the public sidewalk. However, since the actual accessible route isn't marked, it is entirely conceivable that one could assume all elevators are connected to accessible routes. Someone with a mobility impairment could end up having to make a difficult choice between attempting to navigate the treacherous curb/auto obstacle course or trekking all the way back up and around to the accessible route. Since we know how to make an accessible path, why not just do it? Storefront Decoration at University Ave. Radio Shack (circa 2005) - Photo by Polk County Assessor's OfficeWith few exceptions, blank walls ruin the pedestrian experience. Blank walls make it difficult to discern what is happening inside the adjacent buildings, decrease the number of "eyes on the street", and promote an automobile-centric environment. 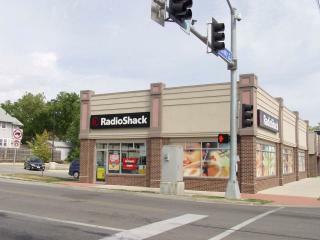 The Radio Shack at University and 42nd Street is an excellent example of how the location of the main entrance can have a huge impact on the urban character of a building. The structure itself, is actually relatively urban. It is built up to a generous sidewalk, with the parking located in back. There is a small path between buildings that allows shoppers to easily make their way from their cars to the stores in the adjacent building. It maintains a good street edge and lines up with the adjacent building. There is just one problem, but it's a killer: the main (only) public entry to the Radio Shack store is on the back corner of the building!